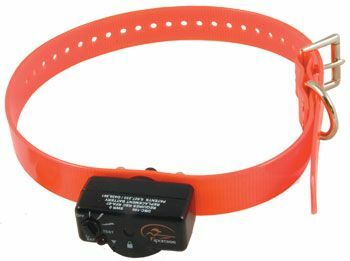 The SportDog Deluxe Bark Control Collar is one of the smallest bark collars available on today's market. This collar weighs a mere 1.5 oz. and still delivers 18 levels of bark controlling stimulation. The SportDog Deluxe Bark Control Collar uses patented technology called "Perfect Bark" to detect both sound and vibration to provide a correction only when it is needed. The Deluxe Bark Control Collar will fit dogs from a 6" - 28" neck and has a lifetime warranty. Weight is just 1.5 oz. Click here - SportDOG NoBark 18 Deluxe Bark Collar Owner's Manual.